I am now safely ensconced in my hotel room in Fredericksburg, Maryland, ready for the first day of Historicon tomorrow. It's about eight o'clock local time, but my body thinks it is one in the morning, so forgive me if my grammar isn't spot on. I got up at 5 AM in order to catch a bus, then another bus, to Heathrow. Then just a jaunty little eight hour flight over the ocean, followed by an hour and a half car ride, and I had arrived. Actually, for all that it was long and included lots of steps, it was mostly painless, just a bit dull. 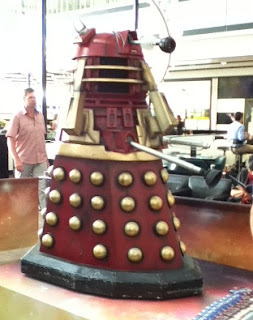 One of the few highlights of the the day was seeing the actual model for the Dalek Supreme, used in the new Doctor Who series, in Heathrow. I'm not exactly sure why it was there, but it was pretty cool. I was quite impressed by the craftsmanship. I fear my only picture taking device is my Ipod, which isn't the greatest. Still, it's better than nothing. On Wednesday morning, I’ll be flying from London to Washington, D.C. to attend Historicon and to see my parents. 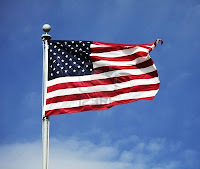 As an American who lives in Britain, I’ve lost count of the number of times I have flown over the Atlantic, but I’m sure it is in excess of twenty. In that time, I’ve learned a lot about making long airplane journeys a more pleasant experience. I thought I might share my top tips. 1. Fly with either British Airways or Virgin Atlantic. 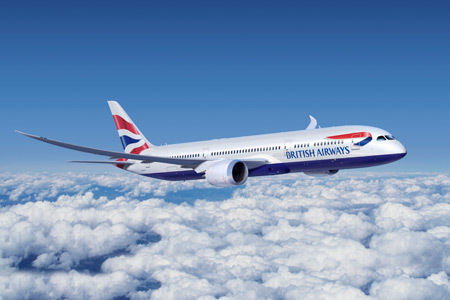 I’ve flow with a lot of airlines, but if you are going UK to USA (or vice versa) these are the best. True, they cost a bit more, but for your money you generally get better service, a more comfortable seat, better food, and a better entertainment package. 2. Go for the Best Entertainment Package. Every BA or VA plane making the London – D.C. run in recent years has been equipped with a personal movie viewer. This can make a huge difference. Getting to watch a couple of movies of your choice, likely ones you haven’t seen, can really make the time fly. Seriously, try and check if a plane has this before you buy the tickets. 3. Drink Lots of Water. The easiest way to have a bad flight is to get dehydrated, and it is very easy to do when you are dependent upon someone bringing water to you. Now, most planes actually have a fountain where you can get water at any time, but make it easy on yourself and bring a bottle of water. Then drink it all and refill it. Remember, you are going to be in the air for about 8 hours, you should drink a good deal during that time. 4. Get an Aisle Seat. Or, if flying in a couple, make sure one of you has an aisle seat. One of the worst things about flying is having to crawl over someone you don’t know in order to get to the bathroom. If you have an aisle seat, you can just pop up at any time you like without bothering anyone. 5. Move Around a Lot. Take every opportunity to go to the bathroom. If you are following number 3, this shouldn't be too big of a problem, but even if you don’t really need to go, go anyway. It’s amazing what a little leg-stretch every two hours or so can do for you. Also, don’t avoid going because there is a line. Actually, it can be better when there is a line, because it gives you an excuse to stand around the back of the plane and get in a longer stretch without blocking the aisle. 6. Bring a Good Book. Everyone knows to bring a book when flying, but many make the mistake of grabbing any old ‘page turner’. Here’s the thing, a bad book is still bad, even on an airplane. There is not much use in bring a book that isn’t actually going to hold your interest. Now you are stuck on a plane with a boring book. In the weeks leading up to your flight, determine your airplane book. This should be something from an author you have a lot of confidence in, maybe the newest book in a series you enjoy. If you can get stuck into a good book, time will pass all the quicker. 7. Bring your own Headphones. While good airlines will give you headphones to use (and bad ones will charge you) they will not be good headphones. With all of the noise on a plane, especially if you happen to be sitting near the engines, you might have trouble hearing your movie/music. Get yourself a decent pair of over-the-ear ‘phones. You won’t regret it. 8. Bring Snacks and Candy. These days, most airline food isn’t much worse than most microwave meals, and on occasion I’ve even enjoyed some of it. That said, it never hurts to bring some back up, something you know you will like. Also, you can never be sure exactly when the food is coming, so having some to hand is a good idea. Candy also helps pop your ears during the often painful descent. 9. Bring a Pen. Invariably you’ll need to fill out a form. It’s nice not to have to ask someone else. 10. Remember, Flying is an Adventure. By crossing the Atlantic you are going a quarter of the way around the planet. That's pretty cool. While for some people it is a common occurrence, most of the population of the world will never get the chance. Yesterday, I received my advance author copy of Zombies: A Hunter’s Guide (Deluxe Edition). Essentially it is the same as the original version, but with a beautiful new binding. I fear its attractiveness hasn’t fully come across in the photograph. I’ve only got a camera phone to work with at the moment. 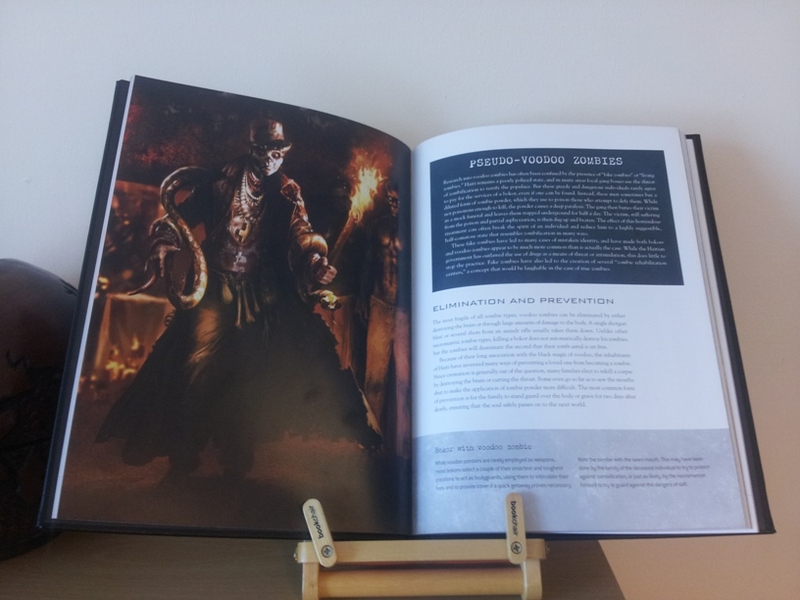 The book is hardback, bound in black leather. The exterior page edges are covered in gilt silver, and the all of the text on both the cover and spine are embossed with gilt silver. The bar code on the back has been printed on a sticker, which actually looks quite classy, but can be removed. It’s a very attractive package, and the production team at Osprey really deserve some credit for making such a beautiful book. Inside, the book features jet black end papers. The original cover, which was pretty good to begin with, is reproduced inside. Otherwise, the insides are the same as the first edition. 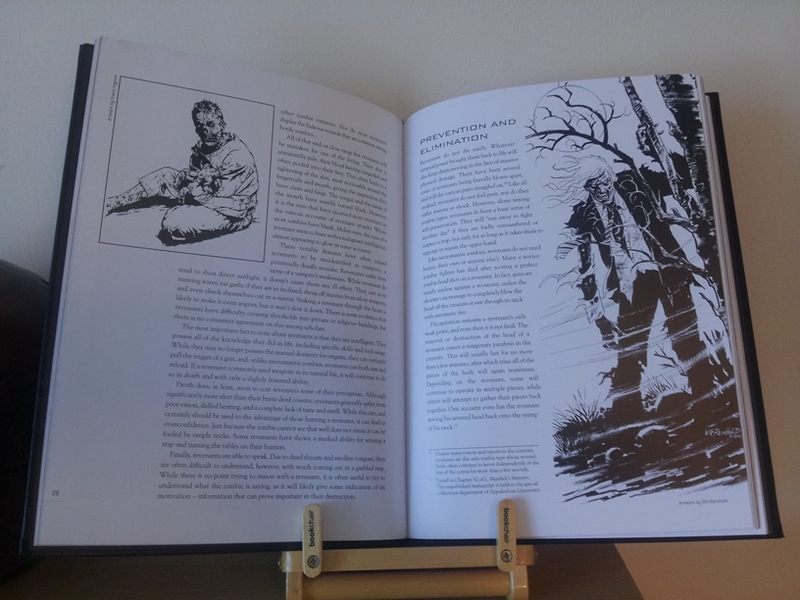 The book is really crammed with zombie artwork and relevant photographs. The other big news about this book is that I will be doing a signing at Forbidden Planet! The book is officially released on 20 September in the UK. The day before, Thursday 19 September, I will be at Forbidden Planet in London at 6 PM signing copies if anyone would like to swing by. If you can’t make it to the signing, don’t fear! Forbidden Planet is taking orders forsigned copies. I’ll sign these on the night of the signing and then they will be shipped out. 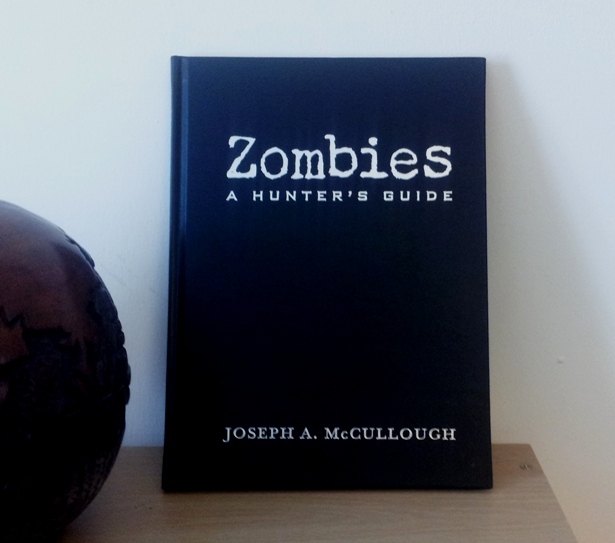 They are also offering the book at a 20% discount, so £12 for a leather-bound, zombie guide. If you have any interest in zombies, or beautiful books, or know someone who does, please pick up a copy. 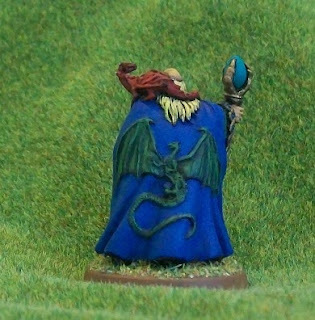 With the work I have been doing on my new wargame, Frostgrave, I have been spending a lot of time thinking about wizards. And the more time I spend thinking about a topic, the more likely I am to paint something associated. This is a classic Reaper figure and, it is a big chunk of lead. That’s actually a 30mm base the figure is on, and it takes up the whole thing. When I first sat down to work on the figure, I decided I wanted to paint it in simple, bold colours. I knew I wanted to paint the little dragon red, so I needed colours that would contrast nicely with it. I've got very nice blues and greens in my paint box, so that's what I went with. I especially enjoyed painting the cuffs of his sleeves, which appear to have little jewels sewn into them. I made him blonde, mainly to increase the brightness of the model, but also because I've painted enough Wizards with long grey beards for the moment. This guy has obviously discovered an anti-greying spell (although apparently not a hair replacement one). 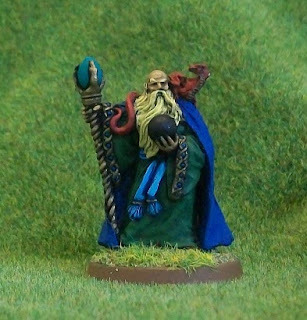 So, can this guy be used for Frostgrave? Certainly. There is no definite way of telling what type of wizard he is, though the crystal ball points towards him being a Soothsayer. He has obviously got himself some kind of staff of power, probably found in the ruins. His familiar is definitely uncommon and would raise a few eyebrows among his peers, but its not impossible. A fun figure to paint, although he is probably slightly oversized to really be a 28mm miniature (even at Reapers 'heroic' scale). Jactance: a rarely used noun meaning 'boasting or bragging'. Also spelled 'Jactancy'. Seen by me in The Hounds of God by Raphael Sabatini. Due to work and holiday commitments, it appears that I have taken the field with the Knights for the last time this season. If that is the case, at least I went out on a good note. Last night the Knights were taking on the Angels, the undisputed best team in the league, who have lost a grand total of one league game in the last three years. With no real expectation of victory, we just wanted to give them a good game. We went on to lose 18-9, but I think that’s a score of which we can be proud. I was given the unenviable task of pitching the entire game, but, despite giving up the 18 runs, I would have to say that I was effectively wild. I picked up 4 or 5 strike outs, a rare enough feat in slow-pitch softball, but quite gratifying against a team that can hit so well. I also had a good game as a fielder, throwing out runners at first, second, and third on a variety of comebackers and unintentional bunts. For the first time all year, I was named MVP (an award given by the other team to a team’s best fielder of the game). I also had a great night at the plate. Hitting fifth in the line-up, I went 3 for 3, with 2 RBIs, and 2 runs scored. My first two hits were both line drives over the left side of the infield. The third was a perfect lob shot into shallow center. All and all, a thoroughly enjoyable night of softball. So that’s it for the regular season for me. There is a chance that I might play in a tournament or two later, either with the team or as freelancer. We shall see. Exciting news here at the Troll! I have been commissioned to write my first wargame! Actually, the event happened over a month ago, but I’ve just been given official approval to make the announcement. The game is called Frostgrave, and it will be part of the Osprey Wargames series in 2015. It’s a fantasy game in which each player controls a wizard, his apprentice, and a band of warriors and leads them into the frozen ruins of an ancient magical city in search of lost secrets of power. Of course, despite being buried in the ice for a thousand years or so, there are still plenty of nasty creatures that survived the deep freeze. Players will have to battle against undead, constructs, demons, and, of course, other wizards as they try to build up their magical libraries. I’m sure that over the coming weeks and months, I’ll be sharing lots of little bits about the game, about the process of writing it, about the problems and the pitfalls. Although I’ve done a lot of writing, including some work in the role-playing industry, I’ve never created my own, complete rules set, at least not for publication. It’ll be a new challenge for me as a writer, but also as a creative thinker. 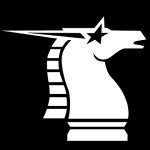 Even wargames with simple rules systems are complex beasts, and writing them is as much a technical exercise as a creative one. Also, those rules will have to be play-tested, a processes that has never come up in any of my previous writing. So what about those cool little sketches, you ask? And what is a Sigilist? Osprey has hired a Russian artist named Dmitry Burmak to provide the artwork for the book. Take a look at his website, and you’ll see why I’m thrilled by this. My first task after being commissioned to write Frostgrave, was to provide Dmitry with notes for illustrations to accompany the game. In the game, there are ten different schools of wizardry and hence ten different classes of wizard. 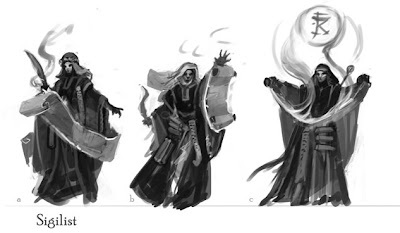 Each of these wizard types is going to be illustrated with a piece of figure art (there’s also two double pages spreads and the cover – pretty good for a 64 page book!). So, I wrote a description of each type of wizard, their general appearance, powers, symbols – that kind of thing. Dmitry quickly came back with three little sketches for each type of wizard, so I could pick the one that was most suitable (or just the one I liked the best!) before he worked it up into a full piece. I have included the three sketches he did for the Sigilist up above. Sigilists are magical scribes, wizards who use the power inherent in words to trap, hold, and release magical energy. In general, they are the bookish, nerdy end of wizardy, but that doesn’t mean they aren’t dangerous. All three of the sketches would have been great representations of Sigilists, but I thought the middle one captured the feel the best. It’s a Miniature Friday two-fer here on the troll. Both of these figures come from the seventy I listed a week or so ago, and both have points for discussion. Glóin, as probably all my readers know, was one of the companions of Thorin Oakenshield who went to reclaim their treasure from the dragon, Smaug. He was also the father of Gimli, a member of the Fellowship of the Ring. This figure comes from Game Workshop’s Escape from Goblin Town box set that they released with the first Hobbit movie. I bought that box set back in January and have slowly been working my way through it. After Glóin, I’ve still got four dwarves left to paint. I’ve said it before, but it bears repeating. 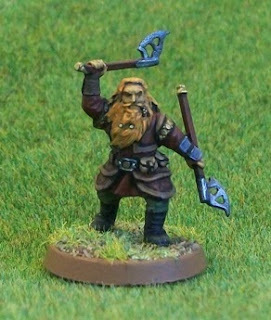 These Dwarves are probably the best, most detailed, plastic wargaming miniatures ever produced. Games Workshop may (deservedly) take a lot of flack for some of their business decisions, but credit where credit is due. I have rarely enjoyed painting a figure as much as I enjoyed painting Glóin. The quality of the sculpting encouraged me to be patient and give the figure the best paint job I could manage. My second figure this week is a ‘Purple Worm’ from Reaper. I believe the Purple Worm is a Dungeons & Dragons monster, but there is no reason it can be used as any old giant man-(or dwarf)eating worm. This is also the first ever figure I have purchased from Reaper’s 'Bones' line of figures. 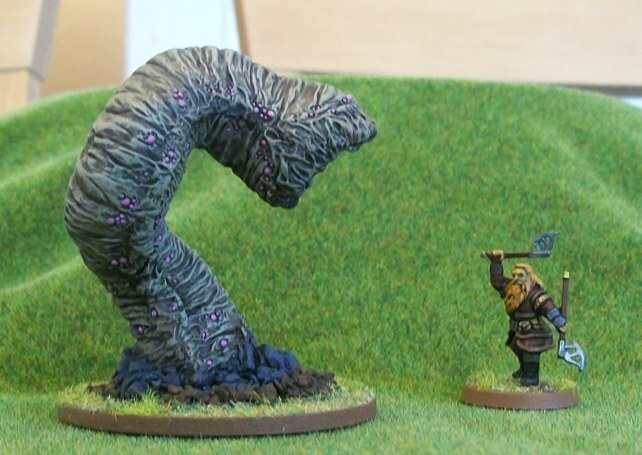 After their huge kickstarter success earlier this year, most people in the miniatures world have heard of Bones, but for those who haven’t, Bones are old Reaper miniatures that have been re-released in some kind of soft plastic. This has allowed Reaper to cut the prices of these figures in half when compared to their metal equivalents. Now, I’m not sure the worm was the best test of the Bones line. It’s is such a large, chunky figure, that there is little chance of it bending, which is one of the major concerns with soft plastic miniatures. However, it did convince me that there is no noticeable loss of detailing between the metal and the plastic. 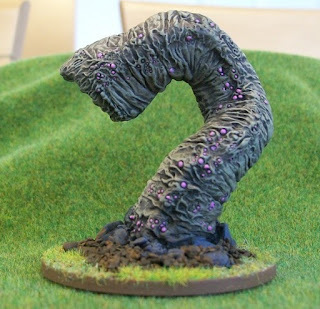 If you look at my painted model, you will see lots of little purple spots (as purple as I could bring myself to paint the worm). All of these spots are detailed on the miniature. Reaper claims that Bones figures do not have to be undercoated and you can apply your paint straight to the miniatures. I couldn’t bring myself to try this. I’m not sure I completely buy it. The plastic just looks too slick. Not that it really matters, I generally want to paint over a black undercoat anyway, so this is really a non-factor for me. 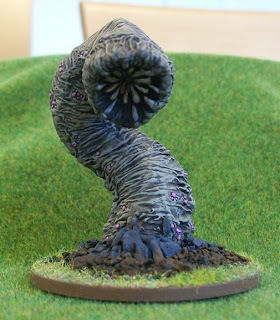 I like versatility in my figures, especially my ‘evil’ figures, and this big, mean worm should work for just about any fantasy or sci-fi setting. A good addition to the collection. It’s one day on the calendar when I really miss home. I hope my family is having a great day, a great barbecue, and a great celebration. I especially hope it is a wonderful day for my older sister, and one that she will long remember with gladness. As for myself, I’m taking the afternoon off. No writing today, except this little blog. Instead, I’m watching live coverage of the Washington Nationals take on the Milwaukee Brewers, and there are rumors that my wife is bringing home a pumpkin pie! The rain went away, and though the sun never actually came out in Oxford, still we took the field for a night of softball. It was another mixed-teams night and, once again, I served as captain for my squad. For the first time all season, I played most of a game at second base. This is probably my ‘natural’ position, or at least the position that probably best suits my skills. As if to reinforce that point, I had a very good night in the field, including one inning where I made all three outs. At the plate, I had a decent night, going 3 for 6, with three singles. Two of those weren’t the greatest of hits, but then some of my outs were on hard hit balls, so I suppose it really does even out. I got my bike back from the shop yesterday. I'd taken it in to get a new chain put on, but I told them to give it a full service and to replace anything that needed replacing. I've ridden that Ridgeback over 6,500 miles, with no replacements but the break pads and tires, so I knew it was about time. 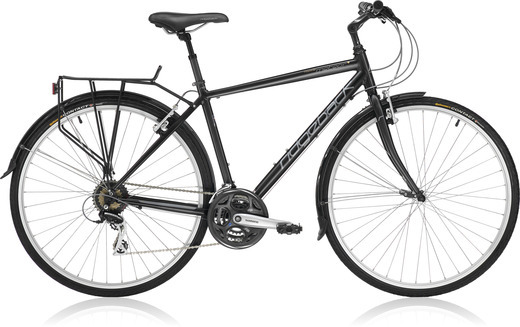 All of that, plus the labour, cost about 1/3 of the original price of the bike, but then again, maybe it is about 1/3 of the bike! Anyway, I rode it home, and it's riding like a dream. Despite the upgrade, the bike still bears many of the scars of past crashes, including the cracked gear displays from last years' forward roll. I didn't ride it to work this morning because it's softball tonight. Well, possibly. It's pouring down rain at the moment, so we'll just have to wait and see.